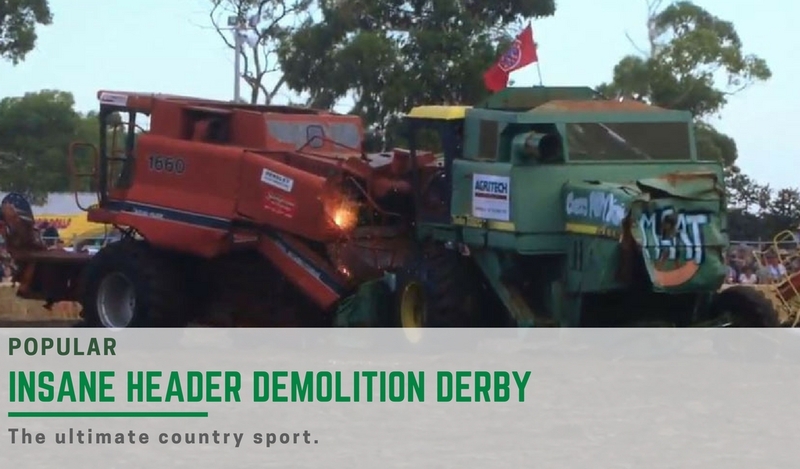 A recent trip to Queensland led me to RD Williams (RDW); a Brisbane based earthmoving equipment company that believes it has a revolutionary new product to unleash down under. 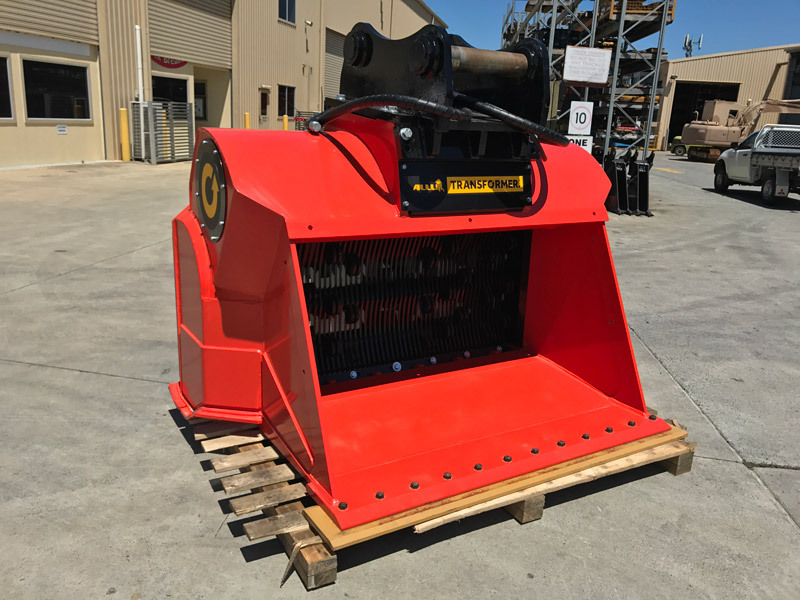 The product is the Allu transformer and it’s a hydraulic bucket attachment for wheel loaders, excavators and skid steers, making it extremely versatile. From Finland, the Allu transformer is designed to screen, crush, pulverise, aerate, blend, mix, separate, feed and load materials all in one stage, removing the need for multiple machines, and can be used not only in earthmoving but also in the mining and agriculture sectors. Originally brought in for the pipeline industry, RDW and its subsidiary Queensland Rock Breakers (QRB) has decided to ramp up awareness of the Allu transformer. "After looking into the Allu transformer, we found there are so many more applications it can be used for," Angus says. QRB is the Australian distributor for the Allu transformer and its processor attachments and are currently focusing on the pipeline and screening jobs, with plans of moving into other industries like glass recycling, compost, general waste and feedlots to process waste manure more effectively onsite. While excited about the business opportunities the Allu will bring, the crew at RDW and QRB are wary of selling it to just anyone, opting to sell the Allu to customers who genuinely require the product. "We are very upfront with customer," Angus says. "We tell the customer we can sell them an Allu, but it has to be application specific," Angus says. "When we sell a rock breaker we ask 10 questions, when we sell an Allu we ask 110 questions," QRB’s Arthur Lewis adds. "We ask questions like, what are they looking to achieve? What does your job comprise of? – we really have to dig deep to find out if the Allu is right for them." The operator will fill the Allu transformer with its specific material, the top screening blades will then spin between screening combs, processing the materials to a selected size — depending on the type of blades and spacing between the combs. Depending on the blade set, the Allu will pretty much screen anything but the lads at RDW and QRB assure me it’s not just a screening bucket; "it’s a processing bucket." "People have a mental idea that crushing means you can just throw lumps of concrete into the bucket and it will crush it down to aggregate – so we like to stay away from the term crushing as much as we can, it’s a screening, processing and transforming attachment," Lewis adds. With so many different blades for different lines of work, Angus harps the importance of getting the correct blade set. 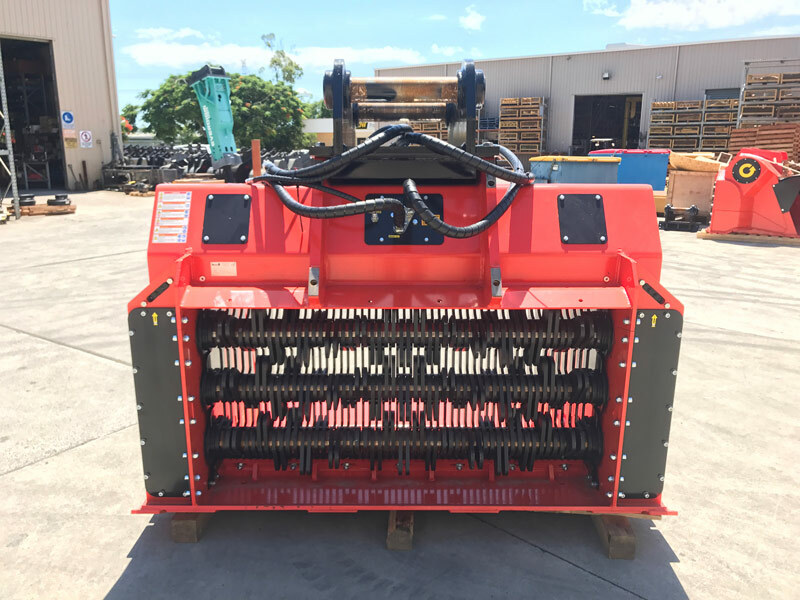 "The TS screening blade set is your general-purpose blades – so a lot of aeration, soil and compost work, pipeline workers also rely on TS blades," Angus says. "When they are digging the pipeline and they lay the pipes, they have to then cover the trench back up with soil which has to be at a certain density and weight. "The TS screening blade set allows the Allu to do that,"Angus says. "Due to ALLU TS’s self cleaning design, it allows the best possible capacity even with wet material - Allu call this innovative design a non-clogging structure," Lewis chimes in. Recycling and landscaping: RDW and QRB trialled the Allu in a recycling environment, using the Allu to process glass bottles into smaller and finer particles. The Allu breaks up the glass bottoms (which means they don’t have to be separated and disposed of), and by-products like plastics remain in the bucket after screening, which can be separated from the primary product —removing the cost of having multiple machines. QRB’s first shipment of the Allu transformer has already sold out, even though it is still yet to arrive on Australian shores —highlighting the excitement for the product. QRB assures readers that this piece of equipment is the real deal. "There are products on the market that do similar things, but not like the Allu, not with the same configuration and set-up and not with the simplicity of the design" Angus says. "They might look the same but they definitely are not the same." Let’s just hope QRB gives us the opportunity to test out the Allu sometime this year – stay tuned. Founded in 1988, the RDW group of companies offer an extensive range of new, reconditioned and used parts, as well as machinery, attachments, repairs and servicing solutions.